The more I read through my news feeds on Facebook, Twitter and Instagram, the more I need to consult Urban Dictionary to find out what people are actually trying to say. I’m only 23 years old, and yet I’m constantly struggling to figure out what “the kids these days” are talking about! You can’t even? You can’t even what? First of all, what a piss poor attitude to have. You should be saying “I can, and I will!” Variations of this phrase include, but are not limited to, “I can’t,” “I literally can’t” and “I just can’t,” and are rarely followed by a verb that actually describes what the person can or cannot do. Second of all, “I can’t even” rarely contributes anything to the discussion; instead, it is a conversational filler. What are you actually trying to say? Usually, the person follows up with the claim that he or she “can’t even” by claiming, “I’m dying” or “I’m literally dying.” Young people of America, “even” is not, nor will ever be, a verb (at least not in the way you mean it to be) — and when you tell others that “I’m literally dying” because of Beyonce’s recent performance, you are clearly a hypochondriac and need to calm down. This is grammatically incorrect and makes you sound like an infant. Does it really take that much more effort to say “feelings” instead of quoting some version of an Internet meme? 3. Using “TL;DR” in real life. “TL;DR” (“too long; didn’t read”) is bad enough in writing because it only encourages our short attention spans to remain short, but in the actual spoken language, it is even worse. If you really want to sum up your story, a simple “in conclusion” or beloved cliché “to make a long story short” will do. This is real life, not Reddit. We don’t need to talk like we are on a message board. Whether you’ve elected to “turn up,” “turn down for what” or “#turnup,” you should be ashamed of yourself. This phrase is a classic example of something I had to look up on Urban Dictionary. Being “turnt up” is not an attractive quality to brag about regardless, but for some reason, the words “turnt up” only make the situation trashier. 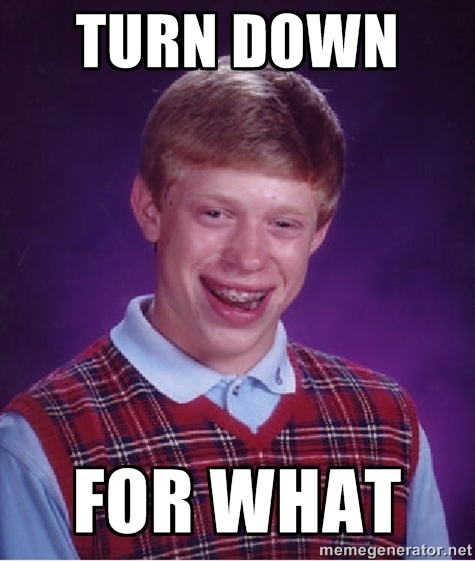 Do what you want in your spare time, but please don’t scream “turn down for what” all over your social media pages. What are some of the phrases you would like to see disappear from our daily conversations?